So, you’ve booked your vacation to Deer Valley Resort. You’re dreaming about fast laps on the famously accommodating chairlifts, carving turns on perfectly groomed runs and challenging yourself off-piste in Utah’s Greatest Snow on Earth®. Now what? Once your trip is booked, it’s time to prepare for what’s to come. From getting your body in shape to reserving all the top amenities, here are 10 steps to ensure an amazing getaway. Two-time Olympian and Deer Valley Athlete Jillian Vogtli offers her suggestions for getting your body in shape for your upcoming trip. Park City, Utah, is training grounds for the best skiers in the United States and the home base of the U.S. Ski Team. Jillian Vogtli, a two-time Olympian and a 13-year member of the U.S. Ski Team, is now a personal trainer. She suggests evaluating your current fitness level and building from there in preparation for your trip. Our first five tips will focus on the most important things a skier should work on, starting with the core. It may be obvious that you need strong legs for skiing, but lesser known and equally important is core strength. It’s most effective to work your core as a secondary muscle group (i.e. a lunge twist) because this stimulates the dynamics of skiing. If this is more than you care to take on, then focus on exercises that target your abs, like crunches, your obliques (the muscles that run down the sides of your torso) with side-ups, and your back, by doing back extensions. Unlike other major muscle groups, the core can be worked daily. These exercises will work your balance while using the proprioceptive muscle groups, as well as your quads, core, and glutes. Throughout each variation, be sure to keep your torso as tall as you can, your navel pulled into your spine, and your knees behind your toes, regardless of how deep you are squatting. Variation 1: Stand on both feet, shoulder-width apart, then lower into a mini squat. Alternate lifting one heel off the ground and hold for a one-count. Aim to do three sets of 15 per leg. Variation 2 : Stand alongside a wall and place your hand on the wall just below your shoulder. Raise one leg in front so that you are standing on one foot and squat (go only as deep as you can while maintaining a tall chest and your knees behind your toes). Aim to do three sets of eight per leg. Variation 3 : Unaided, stand on one foot with the other raised in front of you. Extend hands out in front for balance and squat as low as you can without losing proper form. This last variation is called a pistol squat. Aim for three sets of five to ten per leg. Hamstrings get overshadowed by the quadriceps, when it comes to talking about ski muscle groups, but your hamstrings are your first line of defense in preventing a torn ACL. There are excellent variations of hamstring exercises that can be done using a Swiss Ball, TRX, or even a straightforward hamstring machine. For the hamstring machine, go lighter on the weight and use one leg for three sets of 10 to 12 reps per leg. There are so many exercises that target the glutes, but Vogtli’s favorite are lunges. She suggests doing any one of, or a combination of, the following: back lunge (stand with feet together and lunge by reaching one leg straight back behind you); side lunge (step laterally into a lunge and load the stepping foot); front lunge (start with feet together and lunge by stepping forward); and the curtsy lunge (like a back lunge, but reaching your back foot across to the far side of your standing leg). Add hand weights if you need more of a challenge, and if you are seeking additional balance training, add a bosu-ball underneath your front foot. Remember to keep knees behind toes. Join a yoga class if you need some extra guidance here, otherwise get down on the floor and do some good old gym class style stretches. Stretching should be done daily. Remember to move slow and steady with a focus on quality of movement over quantity. OK, now that your body is getting ready, let’s move onto the rest of the trip. If there’s one concept you’ll need to understand while packing for this trip, it’s layering. Temperatures can vary dramatically in Utah throughout the winter and even in the short span of a day. Our dry mountain air cools down quickly once the sun sets, but our powerful sun heats things up just as fast during the day. For outerwear, invest in a 3-in-1 jacket, one that has a removable liner and an outer shell so that you can shed layers depending on the temperature. Also, pick up some lightly insulated, waterproof (or water-resistant) ski pants. Shell pants alone may leave you wanting more on those rare cold days, but full insulation can be a bit much, especially as we get into later season. For base and mid-layers, long underwear is a must-have. If you are layering properly, you don’t need to wear super-thick and uncomfortable long underwear, but can find a thin wool-blend piece that will wick moisture and keep warmth in. For really cold days, you can add a pair of fleece pants under your ski pants and a quarter-zip fleece on your torso. You’ll also want to pick up a few pairs of thin ski socks, so that you’re not reliant on doing laundry during your vacation. Thin, you ask? Yes, thin. It may sound counterintuitive but they work better than thick socks. The hard plastic of ski boots gets really cold and your feet are reliant on good circulation to bring warming blood all the way down to your toes. The little extra room you gain from wearing thin socks creates a warm pocket of air between your feet and the cold plastic shell of your ski boot. Other essential accessories are a neck gator, a pair of insulated waterproof gloves and goggles. Goggles are critical for making it down the hill. Not only do they protect you from the wind and snow, they’ll protect your eyes from the harsh UV rays that reflect off of the pristine white snow. Sunglasses don’t provide as thorough coverage for this element of reflection. A rose lens will be the most versatile, but if your budget allows it, pick up two spares—one for low-light (snowy/overcast) days and one for bright sunny days. 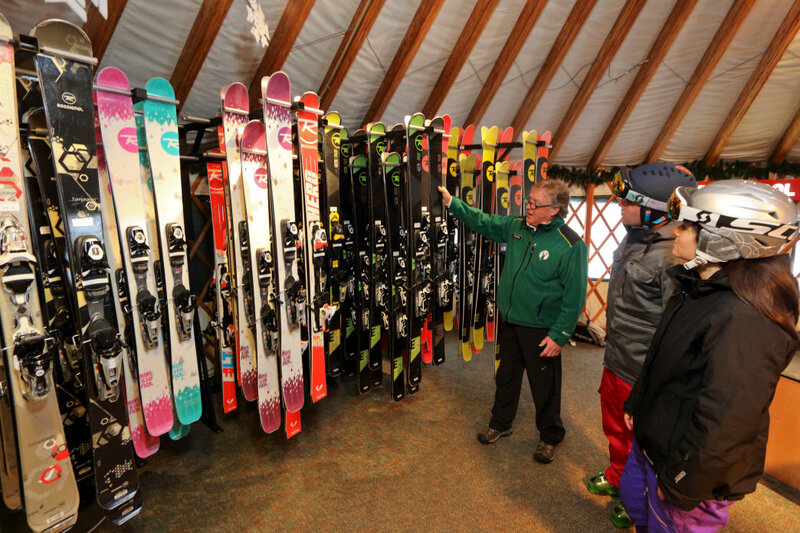 With pre-packaged rentals for juniors, beginners, intermediate and advanced skiers alike, Deer Valley’s rental shop provides a one-stop shop for your whole family’s rental needs. Open before the chairlifts and closed after they stop spinning, you won’t have to worry about missing out on the Deer Valley moments that we know you’re seeking. A fleet of demo-quality Rossignol skis and boots await. If you book your rental for consecutive days, you’ll receive a 10 percent discount beginning on your fourth day. One of the best ways to start your vacation is by taking a lesson. A little boost in confidence leads to more enjoyment on and off the hill. Already confident? 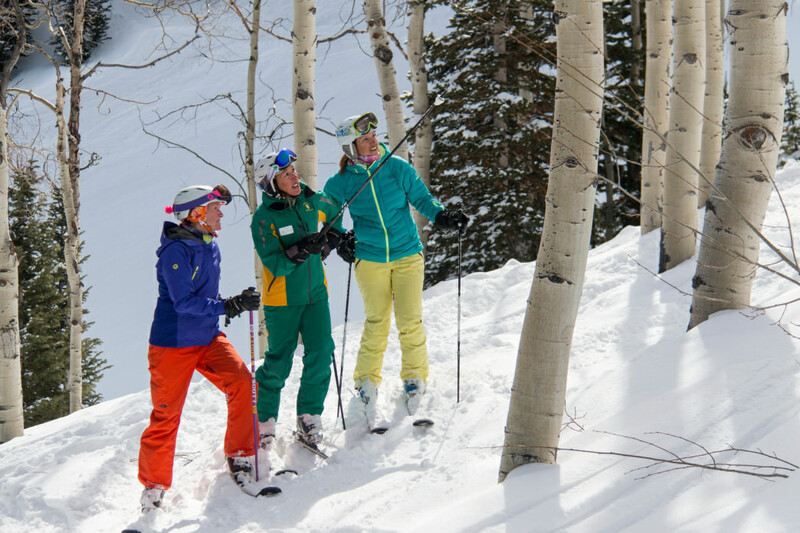 Deer Valley’s experienced instructors can help hone your skills in an unparalleled way. If a private lesson isn’t for you, check out one of the specialty adult clinics, like Steeps & Stashes, which explore lesser-known off-piste terrain. You’ll also find clinics exclusively for men, exclusively for women, or co-ed. This is a great way to freshen up on skills or to make new ski buddies. But don’t delay as lessons can fill-up long in advance. A long day on the hill works up quite the appetite. Luckily, Deer Valley has some of the finest resort dining around, including* Zagat’s* #1 rated restaurant in Utah, The Mariposa. 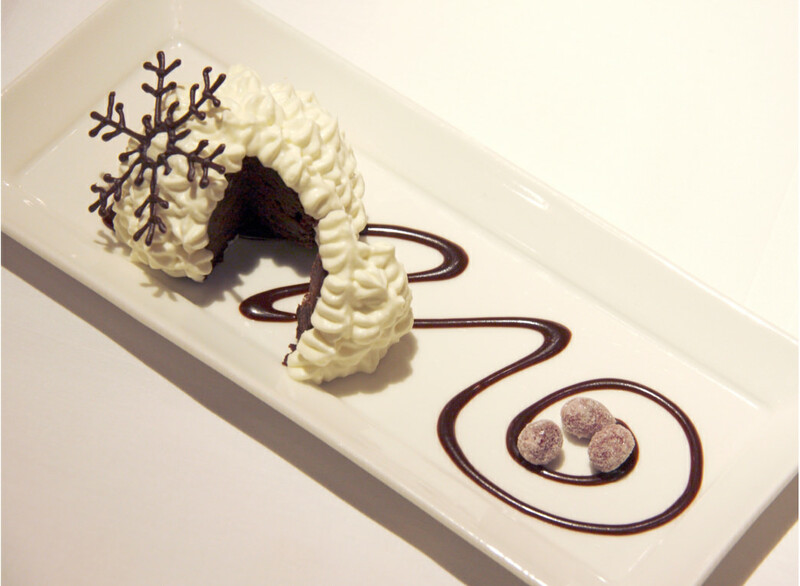 Reserve your spot at one of the most unique dining experiences with Fireside Dining at the Empire Canyon Lodge. There you’ll find favorites from the European Alps, like raclette cheese, fresh baked breads, or fire-roasted leg of lamb, all from stone fireplaces. This meal will please even the most insatiable appetite. If you’re looking for something a little more casual, you won’t have to sacrifice ambiance or taste. Try Edgar’s Beer and Spirits Lounge (colloquially known as EBS Lounge), located on the second level of Snow Park Lodge. It’s the perfect après-ski spot. Body? Check. Gear? Check. Lessons? Check. Dining? Check. Now comes the hard part—waiting for the trip to finally arrive. Thanks for the wonderful advice, I’ve been working out everyday trying to get ready. I can incorporate your suggestions at home. One important thing or two left off drink a lot of water stay hydrated, and do cardio, before hand helps train lung compactly, and take higher altitude better. Don’t forget to tip your wait staff, ski instructor or anyone who has extended themselves to make your stay enjoyable. Many of these people are having difficulty making ends meet! Thanks for the exercise information. Very important for skiing.